"S. Craig Zahler is certain to become one of the great imaginers of our time." -- Clive Barker " C]harm and optimism ... infuse this] dark story. A] delightful combination of tones ... bound to leave readers both smiling and thoughtful.." --Kirkus Reviews "The latest novel from the author of Mean Business on North Ganson Street (2014) is a Victorianesque tale set in twentieth-century America, featuring orphaned Hug Chickenpenny, a child born with several "anomalous" features, such as one red eye, a stump for his left arm, and lumps on his head. Hug's mother dies giving birth to him, and he's found by her best friend, Abigail, who brings him to an orphanage. A sweet and happy baby, Hug is cared for by George, one of the workers at the orphanage, and scorned by another, the icy receptionist Jennifer. George is dismayed when Hug is adopted by a scientist who studies anomalies in nature. Several years later, a tragedy returns Hug to the orphanage, which to Hug's dismay is now being run by the cruel Jennifer. Throughout the ups and downs of his life, Hug remains cheerful and optimistic, pursuing his love of rockets and adventure. Readers will find themselves pulling for the lovable Hug and for a happy ending to Zahler's unusual and unusually appealing tale." -Booklist "A sharp look at family, deformity, community, and belonging. At once moving and merciless, this is a chronicle of a hapless but still altogether human life." -- Brian Evenson, author of A Collapse of Horses "I was intrigued (and still am) by the cover art on this new book. Detailed and beautiful, the cover is a good segue into what to expect from the story. (In case you're wondering, the little boy looking off into the distance is Mr. Hug Chickenpenny. What is he looking at, I wonder?) Learn about Hug's life by venturing into this aptly written wonder of fiction. You won't regret it. " -- Michael Rodriguez, bookseller, Harvard Book Store (Staff Pick) "An exceptional, original, and inherently fascinating read from beginning to end." -- Midwest Book Review "Imagine a blend of Tim Burton's Big Fish, David Lynch's The Elephant Man, and the wonderful quirkiness of a Lemony Snicket book, and you might have some idea of what you're getting into here. I dare you not to fall in love with little Hug Chickenpenny." -- Max Booth III, Dark Moon Digest "The only thing a Zahler work seems to promise its audience is that it will be wildly different from the one that preceded it. 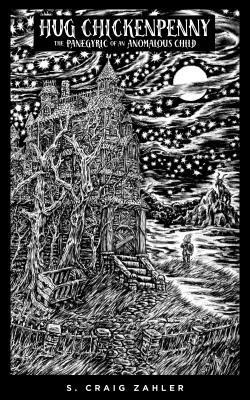 With Hug Chickenpenny, Zahler has once again mashed seemingly incompatible genres to produce a story that is funny, heartfelt, and sumptuously, Burtonesquely gothic. Much like its title character, the novel is ghoulishly anomalous, but eminently lovable. One of the best reads of the year." -- Adam Cesare, author of Video Night and Zero Lives Remaining "A relentlessly readable, inimitable and heart-wrenching story. A lot of people try to create something that defies reader expectations; few succeed like S. Craig Zahler in Hug Chickenpenny. This is also a book that will stick with you." -- Robert Ashcroft, author of The Megarothke "Hug Chickenpenny is much more than literature. It's an experience." -horror talk .com "Complex, well-drawn characterizations, compelling imagery and a well-ordered story arc complete a trifecta of literary accomplishment here that is achieved by few elsewhere. Five-plus stars to Hug Chickenpenny." - Publishers Daily Reviews Hug Chickenpenny: The Panegyric of an Anomalous Child is a gothic, Dickensian take on the Elephant Man, as if David Lynch wrote a fable for unbalanced orphans. S. Craig Zahler is an award-winning screenwriter, director, novelist, cinematographer, and musician. He wrote and directed the films Bone Tomahawk and Brawl in Cell Block 99, and is the author of several novels, including Wraiths of the Broken Land, A Congregation of Jackals, and Mean Business on North Ganson Street. S. Craig Zahler is an author, screenwriter, director, cinematographer, and musician. Born in Florida, Zahler studied film at New York University, and worked for many years as a cinematographer and a catering chef, while playing heavy metal and creating some strange theater pieces. His debut western novel, A Congregation of Jackals, was nominated for both the Peacemaker and the Spur awards, and his brutal western novel, Wraiths of the Broken Land, will be a major motion picture from 20th Century Fox directed by Ridley Scott. Zahler wrote and directed the cult classic Indie Spirit Award-nominated film Bone Tomahawk, starring Kurt Russell and Patrick Wilson, plus the forthcoming Brawl in Cell Block 99, starring Vince Vaughn and Don Johnson. Zahler studies kung-fu and is a longtime fan of animation (hand drawn and stop-motion), heavy metal (all types), soul music, genre books (especially, horror, crime and hard sci-fi), old movies, obese cats, and asymmetrical robots.